The UC lists come with default entries including demonstration files and common folders, names, Web sites, keywords and reminder terms. You can export, import and merge UC List files. This allows you to share lists with other people. Select a file in Windows Explorer ("Redstart Systems", for example), then say "Add File" to add the file to your File list. After adding the file, say "Redstart Systems File" to open the file. Select a folder in Windows Explorer ("Budget", for example), then say "Add Folder" to add the folder to your Folder list. After adding the folder, say "Budget Folder" to open the folder in the current program, "Word Budget Folder" to start Word and open the folder, or "Windows Budget Folder" to start Windows Explorer and open the folder. Open a website in your browser (guitars.net, for example), then say "Add Site" to add the site to your Site list. After adding the site, say "Guitars Site" to go to the site, whether or not your browser is already open. 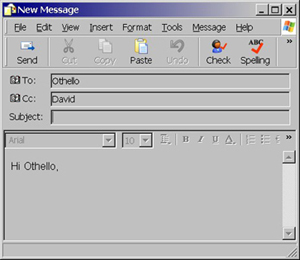 Select a name ("Othello", for example) from any onscreen text, then say "Add Nickname" to add the name to your Nickname list. Say "UC Reminder Command" to call up the UC List dialog box open to the Reminder tab with the cursor in the blank Command field. Then say a phrase ("Send Package", for example) to add the phrase to your Reminder list. After adding the reminder term, say, for example, "3 Hours Send Package" to set your computer to time three hours and then say "Reminding You, Send Package". The Tab list allows you to combine text with Tab commands to speed filling out forms. 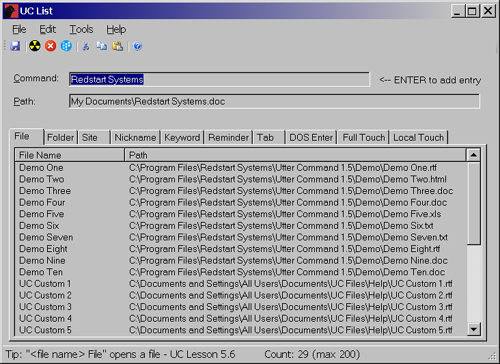 Say "UC Tab Command" to call up the UC List dialog box open to the Tab tab with the cursor in the blank Command field. Say a command ("Address", for example), then say "One Tab" to go to the Path field. Say words you want to associate with the command ("3 Main Street", for example). Example: "1 Tab Address 2 Tab Boston"
This moves down one field, types "3 Main Street", moves down two fields and types "Boston". The Enter list allows you to combine text with Enter to speed the command line interface. Say "UC Enter Command" to call up the UC List dialog box open to the DOS Enter tab with the cursor in the blank Command field. Say a speech command ("Make", for example), then say "One Tab" to go to the Path field. Say the commandline command ("mkdir", for example) that you want the speech command to trigger. The Touch and Local Touch lists are lists of named mouse coordinates. Say the mouse arrow coordinates you want ("38 by 33", for example), then say "Add Touch" to call up the UC List dialog box open to the Full Touch tab with the coordinates entered and the cursor in the blank Command field. Say a word ("Color", for example) to name those mouse coordinates. The Local Touch list works the same way but the coordinates are restricted to the active window. The UC List Touch facility supports multiple monitors. This video shows the UC List File, Folder, Web Site, Keyword and Reminder functions in action. This video shows the UC List Enter function in action (commandline).